Since the inception of the race in 1986, Dothan, Alabama's Critter Run 5K has become a summer distance running fixture in the southeast Alabama / southwest Georgia / northwest Florida tri-state area. Each year the race features a different animal; the "critter" for the 27th annual race on 28 July 2012 was the giraffe. Aside from accumulating a menagerie over nearly three decades, in recent years the Critter Run has been establishing a tradition of tight races. The close finishes started in the 2009 race with Andrew Norton edging out Charlie Johnson 17:13 to 17:18. In 2010 Tommy Heikkinen ran 17:14 to finish just ahead of Brandon Hough's 17:17. Challen Hyman's 2011 winning time of 18:00 just beat runner-up Chase Harris' 18:08. Pensacola's Caleb Carmichael, a University of West Florida cross-country coach, had witnessed two of those close finishes from behind, finishing 5th (18:50) in 2010 and third (18:20). In 2012 Carmichael was ready to be part of the story. 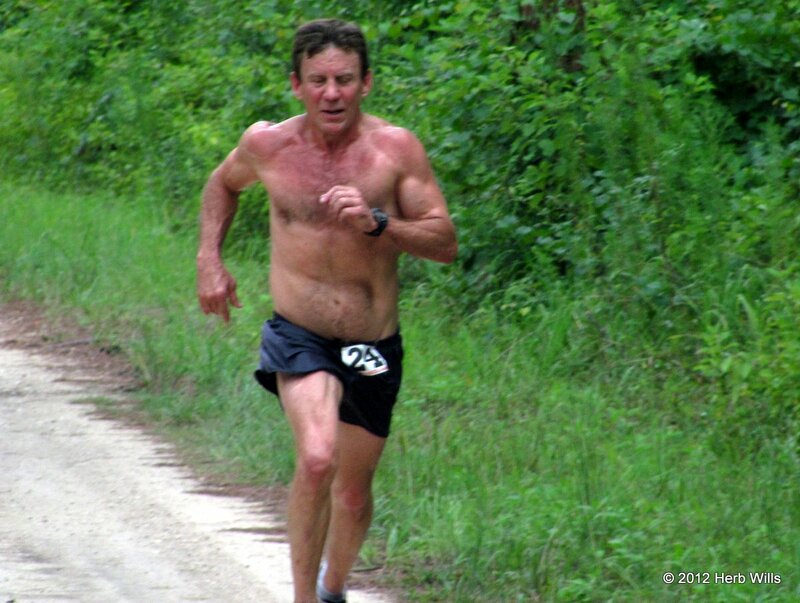 But in the Saturday evening race, Tallahassee triathlete Charlie Johnson, the 2009 runner-up, took the lead. Carmichael trailed Johnson until the final climb up Whately Drive toward the finish in Westgate Park, where Carmichael decided it was his last chance to make a move. He closed the gap. With less than 200 meters to go, Johnson and Carmichael were running shoulder to shoulder going up Whately. Then the coach pulled away. Carmichael turned into Westgate Park with the lead, then crossed the finish line with his own close victory, 16:56 to 17:03 over Johnson. David Seymour of Enterprise, Alabama trailed the two over the line in 18:16, and Tallahassee's Sean Hudson grabbed the top master spot, finishing fourth in 18:29. 200 meters out from the finish, Tallahassee's Sandy Holt was just a few steps ahead of Kim Likens, but Holt widened the gap before the end of the race, beating Likens 22:46 to 22:57. Tallahassee's Likens was the fastest master woman in the race, finishing ahead of Blakely master runner Debbie Wittmer. Wittmer was the third woman overall, placing 40th in 23:09. 338 athletes finished the race. More photos of the 2012 Critter Run 5K. 2011 story, "Hyman wins and Coates repeats at 2011 Critter Run"
2010 story, "Heikkinen and Coates are Critter Winners"
Women runners have had much to say in the three-year history of the Run With The Moose 5K in Quincy, Florida. Sheryl Rosen was the overall winner of the first Run With The Moose, running 20:52 in 2010. 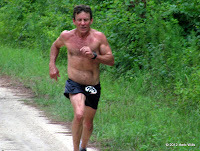 Gary Droze evened the score for the men in 2011 with a 17:57 win. But in this year's race on Saturday morning, 28 July 2012, the women regained the lead in wins, taking the top spot and three of the top four places. The race started just after 8:15 AM, and the athletes headed north on Shelfer Street. Just over half a kilometer into the race the runners made a turn onto King Street. Crawfordville master runner Duane Evans was first to that corner, followed by Violah Lagat and Carly Thomas. It was just weeks away from Lagat's second and Thomas's first cross-country season competing for Seminoles Florida State University. On the way to the two-kilometer mark, the runners negotiated the worst of the King Street hills. Evans was still leading, but Lagat and Thomas were closing. The two Seminoles overtook Evans, and then Lagat ran away from everyone. Lagat finished the race with a 500 meter lead, running a new women's record of 18:45 for the hilly Quincy 5K. Thomas finished second overall with a time of 20:50. Evans placed third in 21:16, the first male and the fastest master in the race. 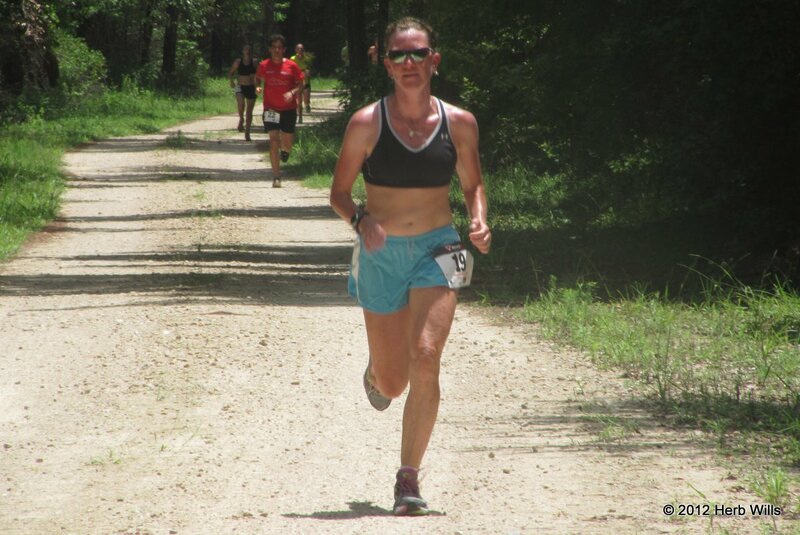 Fourth overall at 22:04, Katelyn Kelly was the third female finisher. Sandra Canada was the fourth woman the the first female master; she placed ninth overall in 26:11. Another constant in the history of the race is the carping about the hills. The hills aren't going away, though, nor are the hosts from the Moose Lodge about to air condition the course. But the runners do get an accurate 5K, a tour of some beautiful Quincy neighborhoods, traffic control from local law enforcement, and an event that benefits Special Olympics. Surely that's worth enduring a few hills. 2011 story, "Droze & Droze rack up Moose 5K wins in Quincy"
2010 story, "Rosen outraces the herd at the Run With The Moose 5K"
Valdosta All-Comer Track Series Meet #9. 6:30 PM ET. Scruggs Track, Valwood School, 4380 Old US HWY 41 N, Hahira, Georgia 31632. Track series flyer. 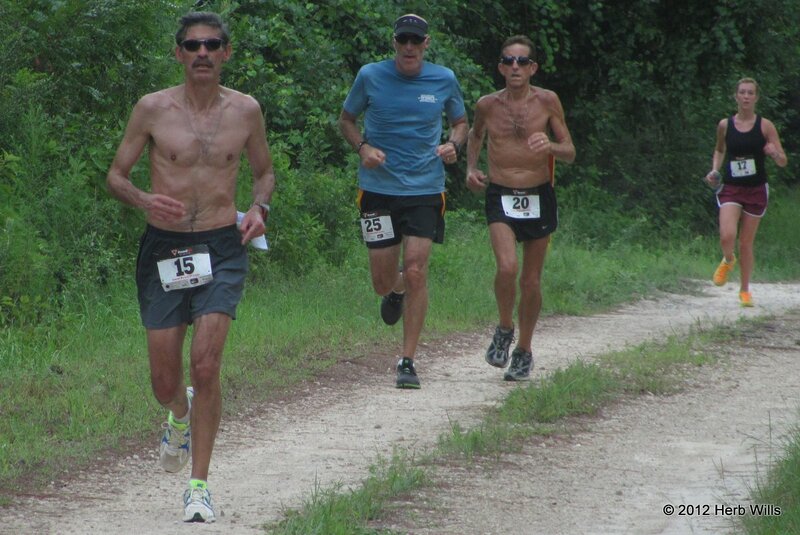 Walter Phelps Memorial 5K Trail Run and one-mile fun run. 8:00am ET one mile / 8:30am ET 5K. Lee County YMCA, 316 Robert B Lee Drive, Leesburg, Georgia. 2011 story. Online registration at active.com. Habitat's Home Run 5K and one-mile fun run. 8:00 AM ET 5K / 9:00 AM ET one mile. Patterson Street and Roosevelt Street, Valdosta, Georgia 31602. Online registration at RunSignUp.com. Valdosta All-Comer Track Series Meet #10. 6:30 PM ET. Scruggs Track, Valwood School, 4380 Old US HWY 41 N, Hahira, Georgia 31632. Track series flyer. Race for Education 5K. 8:00 AM ET. McKey Park, Burton Street, Valdosta, Georgia 31602. Online registration at RunSignUp.com. Flatlander Dawg Gone Good Road Race 5K and one-mile fun run. 7:30 AM ET one mile / 8:00 AM ET 5K. Behind Lakeland First Baptist Church, 15 East Main Street Lakeland, Georgia 31635. 2011 story. Online registration at RunSignUp.com. 5th annual Robin Lotane Memorial Red Cross Hurricane Run 5K. 8:00 am ET. Tallahassee Red Cross, 1115 Easterwood Drive, Tallahassee, Florida 32311. 2011 story. 2010 story. 2009 story. Bob Lotane, 850-545-9446, or Debara Jump, debara.jump@tallyredcross.org or 850-402-5612. 4th annual Valdosta Labor Day 5K & 1500m fun run. 8:00am ET. 3200 North Ashley Street, Valdosta, Georgia 31602. 2011 story. 2010 story. Online registration at runsignup.com. Flagler College Tallahassee Run for the Books 5K. 9:00am ET. Lifetime Sports Complex, Tallahassee Community College, Appleyard Drive at West Pensacola Street, Tallahassee, Florida. Karen Atkinson, atkinsok@tcc.fl.edu or 850-201-8070. Dana Stetson's Mike The Dog races aren't quite crazy, at least compared to what else is out there. After all, even running the Western States 100 Mile or the Badwater aren't regarded as crazy even if they're out of the mainstream. But if you do regard running an ultramarathon in Death Valley as insane, compared to that example of a psychosis, participating in a Mike The Dog race is at worst neurotic, and probably only qualifies as eccentric. The Mike The Dog half marathon may have seemed slightly lunatic, running back and forth over the same hill ten times, but it's a poor man's lunacy. 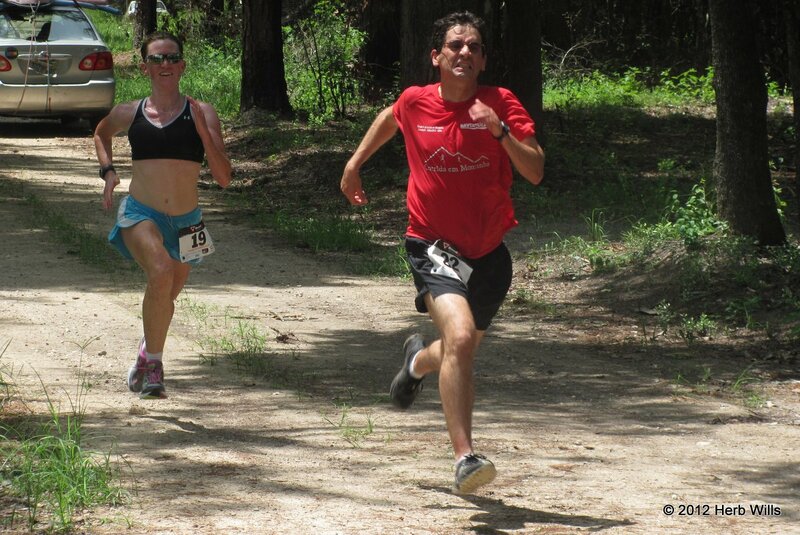 Running five miles in the Wakulla State Forest doesn't make it onto the scale of insanity at all. So for the third annual Mike The Dog Five Mile, Stetson upped the ante by moving the starting time to 2:00 on Sunday afternoon, 22 July 2012, to take full advantage of midsummer heat and humidity. Swarms of ravenous mosquitoes infested the forest, courtesy of tropical storm Debbie. The air along the course was scented with roadkill and anxious skunk. But Stetson wouldn't change the fact that even under the worst conditions the forest is a scenic place to run. The footing was good, the course was well marked, and there were a couple of self-service water tables to lower the chance of heat exhaustion. Stetson wasn't around for the start of the race, which wasn't a problem because he didn't plan on either running or timing it. Nevertheless, the run began approximately on time. Mariah Tinger got out in front by a respectable margin, but then she paused to drink at the 2500-meter water table. While she was taking on fluid, Juan Ordoñez caught up. The two left the water table together, and once again Tinger built up a lead. At the turnaround and 4,000-meter water table Tinger stopped again, and Ordoñez overtook her again. The runners headed back along the course toward the finish, Ordoñez and Tinger trading the lead. Around five kilometers a deer bounded across the path in front of the leaders. The race continued. Coming up on the finish, Tinger led by half a step, but Ordoñez pulled ahead during the final kick, winning by less than a second. A couple of minutes later, Jeff Nielsen crossed the finish line in third place, the fastest master runner in the race. The below results are incomplete and unofficial. 2011 story, "Sand, Sweat, and Success for Molosky and Calder"
In track and field, the high jump always ends in failure. So does the pole vault, for that matter. The point is that the athletes keep jumping until they fail to clear the bar, with the possible exception of the winner. You don't usually get that in running events-- you may not win, but you do have a chance to finish the race. Not so in the Devil-Takes-The-Hindmost run. Starting with the second lap, the Devil takes the slowest runner off the track at the end of each lap. This continues lap after lap until there is only one runner left on the track, the winner. For everyone else, the race ends with the failure to keep up. You can think of it as a metaphor for mortality. You can view it as a microcosm of economic competition in the modern world. Or you can just watch it hilariously unfold. 23 runners gathered on the Mike Long Track at 7:00 PM on Saturday, July 22, for Tallahassee's 2012 edition of the Devil-Takes-The-Hindmost. It was the second year in a row for the event, which is in danger of once again becoming an annual event. As in 2011, Elizabeth Stupi played the role of the Devil, and led the runners once around the track before pausing at the end of the front straightaway to wait for her first victim. It was seven-year-old Bernadette Burns. She had run the first two laps with her father, Michael Burns, but her parent stepped ahead of her at the end of the lap, leaving her for the Devil. The older Burns went out at the end of lap three. Either through greed or confusion, the Devil also took a second runner, Jeff Starks, on the third lap. Dana Stetson was the next to go, then Michael Molen outkicked his sister Emily Molen on lap five, only to be taken himself on lap six. The Devil got Madeline Horgan on the seventh lap, leaving Ashley Daily as the only woman left on the track, but only until the end of lap eight. The field continued to dwindle. There was occasional drama, as when Bing Xu sprinted past Jasen Fulghum on lap 14, leaving Fulghum for the Devil. Brian Molen and Paul Guyas both went out on lap 17, one taken by the Devil and the other too winded to continue. John Robida was grabbed after 18 laps, leaving three high school runners and Peter Kaus on the track. Jarod Hoffman lagged on the 19th lap, and the Devil got him. Kaus outkicked Zac Buchholz to survive the 20th lap, but that left him too fatigued to keep pace with Sukhi Khosla. Kaus bowed out after lap 21, leaving Khosla to complete the 22nd lap alone, as the winner of the 2012 Devil-Takes-The-Hindmost Run. The Devil left the track having caught 22 runners. Khosla got away this year, but the Devil is patient, and knows that there is next year, and the year after that. See you then. 2011 story, "Akbar beats the Devil"
2004 story, "A diabolic tradition renewed: Devil-Take-The-Hindmost (2004)"
Two years after finishing third in Valdosta's inaugural Break Bread Bun Run 5K, Mark McLeod was back on the streets of Wood Valley for the 2012 race on Saturday morning, July 21. This time Fitzgerald's McLeod buried the competition, finishing nearly a quarter mile ahead of the runner up and setting a course record of 18:21. Valdosta's Masked Avenger was the second runner to complete the circuit through the hills of Wood Valley, crossing the finish line in 19:50. Tyler Thurman of Lowndes High placed third in 20:21, followed by the first master runner in the race, Sean McConnell (4th, 20:33) of Adel. For a close race, you had to turn to the women's competition. Valdosta's Alice Smoot and Savannah's Sarah Batt fought all the way to the finish line, contesting both the women's title and the female master's title. At the line it was Smoot, with both runners clocked in the same time of 21:11--a new course record for women. Valdosta's Elizabeth Smith took third in 23:45. Lauren Tosky of Leesburg, a winner at Valdosta's fourth annual Barnes 100 Years 5K seven days earlier, placed fourth among the females in 24:29. 56 athletes finished the third annual Bun Run 5K. 2011 story, "Avenger and Arreguin emerge from the Wood Valley Hills as Bun Run Champs"
2010 story, "Gardner conquers Valdosta's Wood Valley hills to win the Bun Run 5K"
Health & Educational Relief Organization 5K. 8:00 AM ET. 116 Honors Way, Florida State University, Tallahassee, Florida. Online registration at active.com. 3rd annual Break Bread Bun Run 5K. 7:30am ET. Valdosta YMCA, 2424 Gornto Road, Valdosta, Georgia 31602. 2011 story. 2010 story. Online registration at RunSignUp.com. Mike the Dog Delilah 5 Miler and Sam 5K. 2:00 PM ET. Wakulla State Forest, State Road 267 (3 miles west of State Road 363). 2011 story. Entry form and flyer. Dana Stetson, danastetson@yahoo.com or 850-668-3839. Valdosta All-Comer Track Series Meet #8. 6:30 PM ET. Scruggs Track, Valwood School, 4380 Old US HWY 41 N, Hahira, Georgia 31632. Track series flyer.